It is the phenomenon that changes will happen, be it a human being or the Mother Nature. Yes, Nature change as day passes; seasons change so does the humans. However, there is a major difference between the two. Nature does accept the change whole-heartedly and always is at its best while Human beings are unacceptable to any change, be it behavioural or any other matter. However, you must always remember that what Nature reflects to you depends upon what and how you see. You must have heard about Empty/half filled glass example several times. But that is the fact that most people will see it to be an empty glass and not half filled. Something is always better than nothing so even half glass water is good for that matter. This shows the positivity towards life and representation of your own spirit with regards to the way you look for any matter. Nature has its own reactions but it is always high on spirit. It is the spirit of yourself, which is seen via nature. If you tend to look out for the negative aspects, you cannot find ray of light. 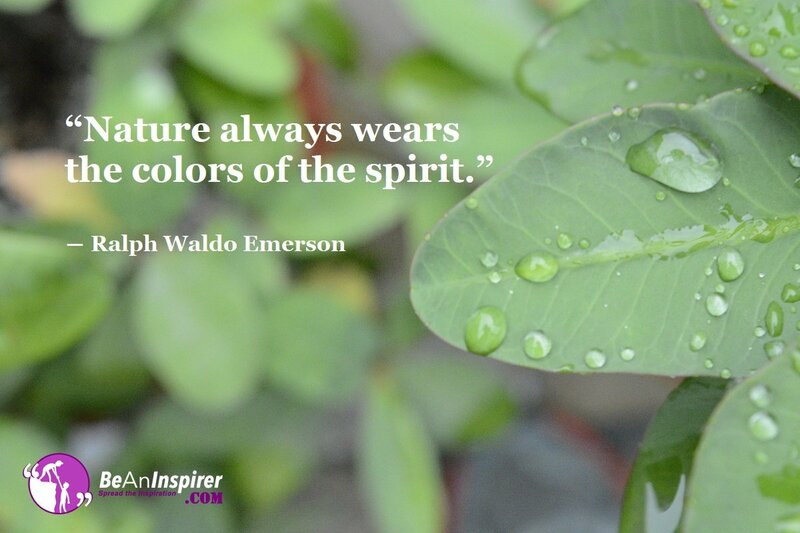 It’s our characteristics, behaviour and beliefs which describes the colourful spirit of the nature. Everything in life happens for a reason. The sole purpose can be seen via two ways. If you happen to choose the negative one, you would find all your surroundings to be negative but if you opt for positive one, you will find yourself in happy space even if it’s the worst phase of your life. Why it is that one day you see the nature is at its best and other day you feel it to be at worst? Nature hasn’t change but it’s the way you look at nature has changed. Whether you are sad or experiencing a gloomy day, just look at the nature. How it changes every day. From Cold Windy Breeze to Misty Rainfalls to Heat Waves, yet it never complains. Same way not every day is a good day for humans. Accepting it and thinking it to be the representation of your own spirit, let you pass through it smilingly. The more we complain the more we will be in distress. The Nature reflects to you the Livelihood, the Calmness, Wilderness, Happiness but it is we who take it to be aggressive, irrational and unreal most of the times. Connecting to the natural world is more powerful than connecting yourself to virtual world. The Nature reflects to you the Healing, Cure, the Positivity, the Refreshness and much more in return if you pursue it to be beneficial one. Nature has immense to provide to human beings but hardly few of them understand and achieve it. Getting near to Nature lets you understand the true meaning of life and uplifts you purpose of living. It is we who needs to understand that Nature wears the colourful spirit each day but we have become blind to even see it with bare eyes.